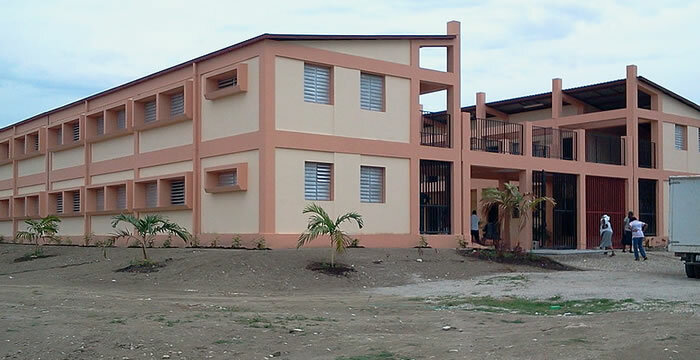 Here is a picture of Institute Monfort school for the deaf and blind in Haiti. Institut Montfort School for the deaf and deaf-blind children in Haiti was founded in 1957 by the Daughters of Wisdom. It is the first school in Haiti specializing in educating children who are deaf and deaf-blind. The institute is comprised of three schools located in three areas: Santo, Croix des Bouquets (the largest), St. Marc and the third in Lavaud. The school started with a class of seven children now boasts more than 650 students. Many of them reside in the school dormitories because they live too far to travel every day, or they come from families with minimal or no resources. The campus in Port-au-Prince was completely destroyed by the 2010 earthquake, but was rebuilt to a larger and more modern form in Santo, Croix Des Bouquets by World Community. In addition to providing basic education, the institute gives lessons in sports and fine arts, runs a gift shop which sells items made by the children at reasonable prices. 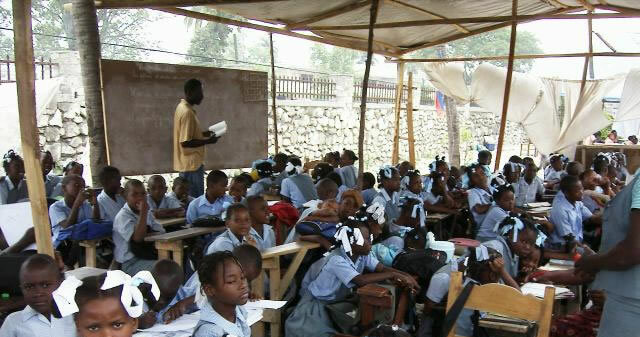 The institute operates under the support of a non-profit organization, Friends of Montfort, Inc. whose mission is to provide: encouragement and financial support to deaf and deaf-blind children; scholarships for college-bound deaf high school seniors and facilitate open-heart surgery for needy Haitian children. 5.18.16 - Collier County, Florida. Six children sent home from school for wearing t-shirts with the Haitian flag and national coat of arms on Haitian Flag Day. Five school girls were sent home for wearing T-shirts with the Haitian flag and national coat of arms on Haitian Flag Day, because it was a breach of the Collier County school district's student code of conduct. However, according to such code of conduct, only four flags can be worn in school: The United States flag, the POW/MIA flag, the Florida state flag, and the school's flag... but no Haitian flag. The POW/MIA flag was designed during the Vietnam War, as a symbol of national concern about U.S. military personnel who were Prisoners Of War (POW) and those who are still Missing in Action (MIA). The students later said, they felt discriminated, because, their parents were from Haiti. The Haitian Flag day is indisputably a symbol of general pride for all people of Haitian descent. Every year, it is observed in Haiti and in a number of U.S. cities with large populations of Haitian Americans. It marks the day (May 18, 1803) when the first Haitian flag was flown during the slave revolt against the French that led to the nation's independence. The school is situated in the town of Immokalee, Florida, where 8.9% of the people are Haitian descent. 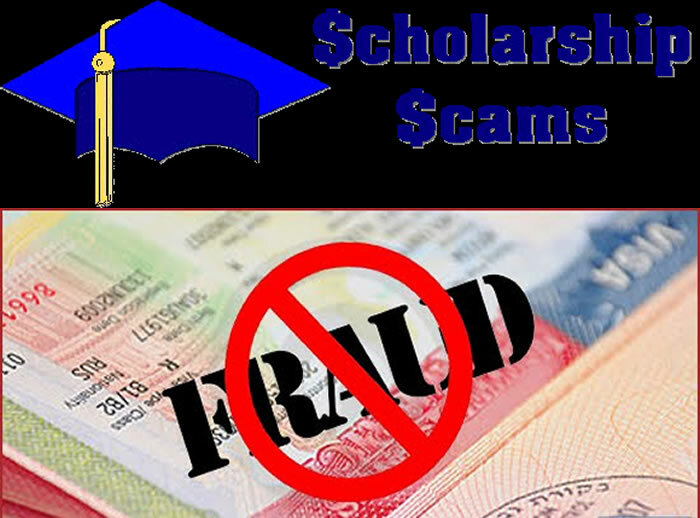 New US Visas and scholarships scam targeting Haitians. On February 22, 2016, a note of caution has been issued by the US Embassy in Haiti alerting the Haitian people who are seeking U.S visa or intend to apply for U.S scholarship over the internet. A group of racketeers using Sophia Martelly's name, is falsely claiming that they can arrange both. They are using the following email addresses: (i) ambassadeamericaine.haiti@yahoo.com; (ii) unmaria51@gmail.com, with a point of contact named Samuel at +509-3990-6218 and an accountant named Evelia Jean Charles. The note issued advises people to stay away from these racketeers and every aspiring individual must know that the US Embassy never authorize any person or group to arrange US visa or scholarship. The only way to get them is through a direct contact and application to the US Embassy. Have you ever wondered how can a child learn in such a tough environment. This is the daily reality of many school age children in Haiti. They spend their day in a hot classroom, with no electricity, not even a running fan. The seating is often not comfortable. In some schools such as the public Lycees in particular, you find students standing up, seating in the windows, by the entrance door just to assist class. This is beside other problems you often find in the school system in Haiti such as teachers unqualified for the subjects they are teaching. These teachers are often called "Jack of all trades". Also, just like in the transportation or prison system in Haiti, most classrooms are overcrowded. 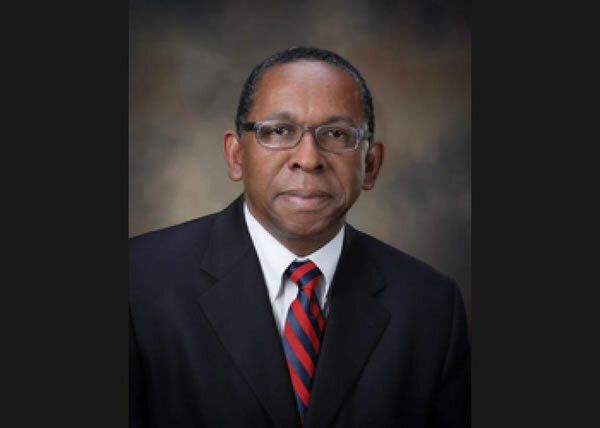 Here is a picture of Mr. Jhonson Napoleon, president of Azure College, a South Florida college. Azure College, one of the fastest growing Private-Sector College in South Florida, offers health science degree programs. During the first week of September, the college has been relocated to a new location in Miami Gardens, Florida. The relocation has been made on the graduation day of over 200 Registered Nursing and Practicing Nursing graduates. While inaugurating, Jhonson Napoleon, the President of Azure College, along with his wife and Vice President Betsy Napoleon said, the new location is a lot more than a new home and better accessibility; it has given the institution a new identity. We might remember that, during the last year, Mr. Napoleon filed a lawsuit against 'CareerSource' of South Florida, because that institution failed to reimburse him $204,950 worth of incurred expenses for opening two career centers for refugees in Hialeah and Little Haiti. On December 2012, Roderick Rick Beasley, the executive director of CareerSource and Napoleon signed a contract to open two career centers in Little Haiti and Hialeah on lease at a lease cost of over $300,000 to help Cuban and Haitian refugees find stable livelihood. However, the Beasley's agency never reimbursed him any amount above $200,000 until the contract expired in March 2013. 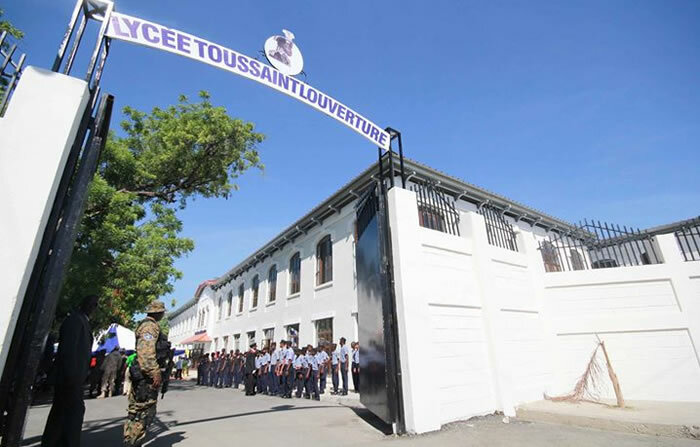 In the reconstructed 'Lycee Toussaint Louverture ' premises 300 students and 2,800 students can study in the basic and secondary sections respectively. 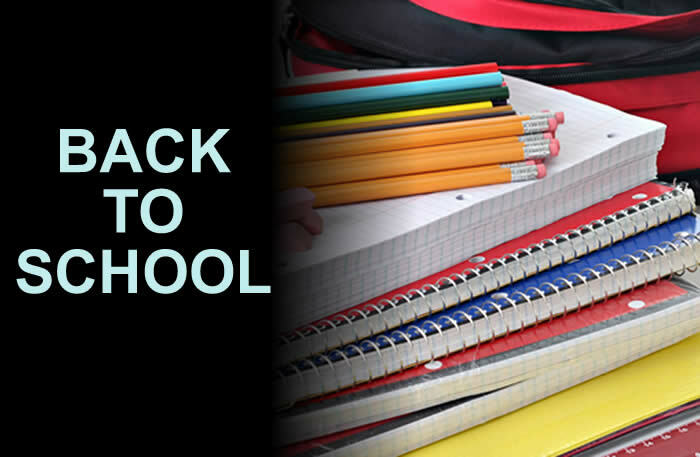 The students in the secondary section can study in any of the two shifts: morning or evening. Twenty one and twenty two classrooms have been allotted for morning and evening sections respectively. 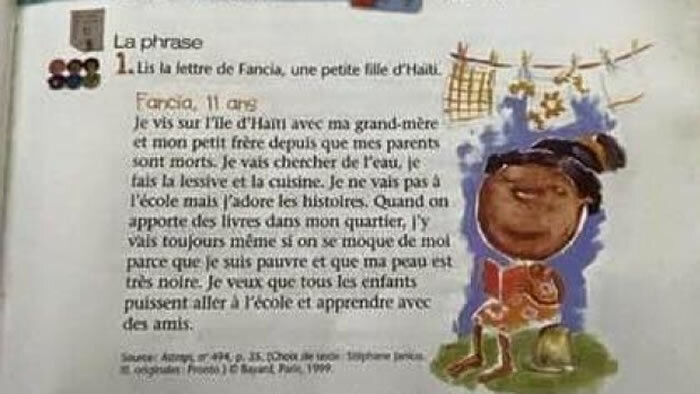 Though the Haitian Constitution requires that a public education be offered free to all people, the Haitian government has not been able to fulfill this obligation. It spends about 10% of the federal budget on elementary and secondary education. More than 80 percent of primary schools are privately managed by nongovernmental organizations, churches, communities, and for-profit institutions. Here is Lycée Toussaint Louverture in Rue Saint-Honore. Vocational training in Haiti is given at different levels between the second half of secondary school and the first half of the university. It includes trainings on technical or professional education, housework or professional skills. General secondary education consists of a three-year basic cycle and a four-year upper cycle that leads to a baccalaureate (baccalauréat, or the equivalent of the high school diploma) and possible university matriculation. 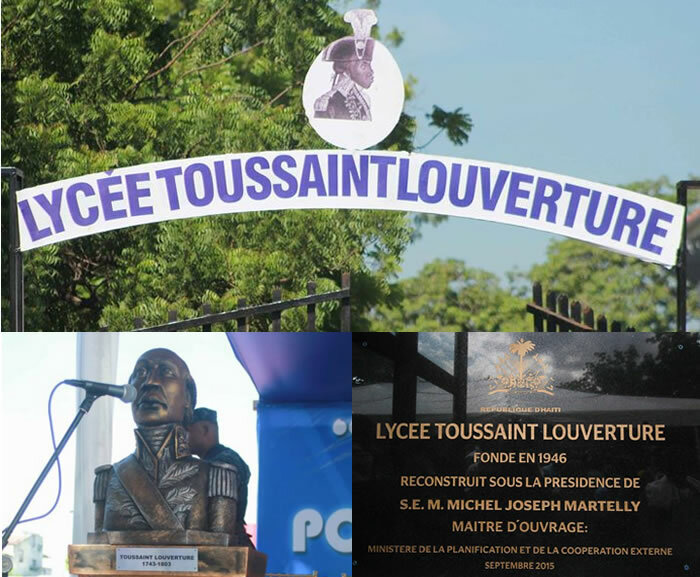 'Lycee Toussaint Louverture 'was founded in 1946, during the rule of the government of Dumarsais Estime. The name of Toussaint Louverture was chosen for the school because that great Haitian liberator during his lifetime fought for equality and his name represents the aspirations of people everywhere seeking freedom and justice.